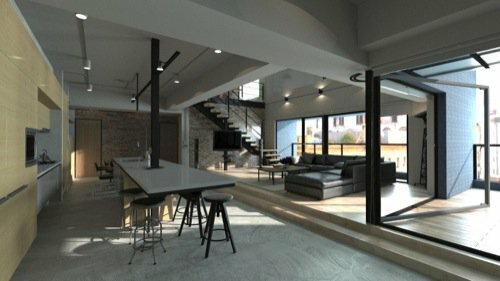 We often receive messages from architectural visualization artists willing to migrate to a full Blender workflow. Among the most common questions between those artists is the ideal hardware to work with architectural visualization. For quite some time our recommendation was to get a GTX graphics card to use with Cycles because AMD cards didn't work well with Cycles. Unfortunately, some people only discovered that after they had already made a purchase of a Radeon card. With the upcoming Blender 2.79, the support for AMD graphics cards will receive a massive upgrade and will put this hardware back on the recommended gear for a good render setup. But, if you want to try a “native” solution, from AMD itself, you can take a look on the Radeon ProRender. That is a free render engine designed to work with Radeon cards. They have versions of that render engine for several different software like 3ds max, Maya, and SolidWorks. If you have an AMD card and want to try, ProRender visit this link to download the renderer. That is a separate render. Does it worth to try? If you have a Radeon card and would like to try a different way to use your GPU stream processors to get lower render times, it may surprise you! Just remember that Blender 2.79 will also bring improved support for that same hardware. A few months ago artists with AMD cards had to render their projects mainly with the CPU. Now they are starting to have a lot of options to work with their GPUs. For artists using Macs, you should skip ProRender, because they only offer versions to work with Windows and Linux. Just wait for Blender 2.79.